Mumbai, India — Jet Airways, based here, today announced that it will commence daily nonstop flights from Mumbai to Johannesburg from April 14, 2010. The airline will introduce services to South Africa using a new state-of-the-art Airbus 330-200 aircraft. The launch of this new international route marks the first time that Jet Airways is adding destinations to Africa on its international route network, according to a press release received by Elite Traveler.. Flight 9W 242 will depart Mumbai at 0205 hours, arriving in Johannesburg at 0735 hrs. On the return leg, flight 9W 241 will depart Johannesburg at 1100 hrs, arriving in Mumbai at 2330 hrs. According to Nikos Kardassis, CEO, Jet Airways, “Jet Airways is delighted to enter Africa with its daily Mumbai-Johannesburg service. South Africa’s reputation as a leading tourist and business destination and the fact that it will play host to the 2010 FIFA World Cup also presents a huge opportunity for Jet Airways. We are confident that our airline will soon emerge as one of the first choice carriers on this popular route given our unparalleled domestic network in India and ever-expanding international footprint. South Africa, as well as the African region at large, is an important market for us and we are confident of capturing and growing the market”. With 11 official languages, South Africa is one of the most popular tourist destinations in the world, with something for every traveler. It is also emerging as one of the leading business and conference destinations in the world. The spacious full-length wide-bodied twin aisle cabin of the A330-200 is configured in two classes, with 30 seats in Première (Business Class) and 190 seats in Economy. The airline’s Première guests will enjoy a 180-degree flat bed with lumbar support and massage systems, oversized table, laptop power, telephony, SMS, email and live text news to deliver a flying office, state-of-the-art On-Demand Panasonic In-Flight Entertainment (IFE), as well as the finest in-flight dining service, among other amenities. Johannesburg will be the twenty-second destination in the airline’s international network. Jet Airways currently flies to New York (both JFK and Newark), Toronto, Brussels, London (Heathrow), Hong Kong, Singapore, Kuala Lumpur, Colombo, Bangkok, Kathmandu, Dhaka, Kuwait, Bahrain, Muscat, Doha, Abu Dhabi, Dubai, Jeddah, Sharjah and Riyadh. For more information on this and all other news from Jet Airways, please visit: www.jetairways.com. Jet Airways currently operates a fleet of 89 aircraft, which includes 10 Boeing 777-300 ER aircraft, 12 Airbus A330-200 aircraft, 53 next generation Boeing 737-700/800/900 aircraft and 14 modern ATR 72-500 turboprop aircraft. With an average fleet age of 4.66 years, the airline has one of the youngest aircraft fleet in the world. 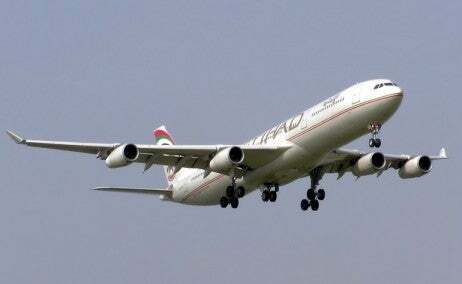 Flights to 61 destinations span the length and breadth of India and beyond, including New York (both JFK and Newark), Toronto, Brussels, London (Heathrow), Hong Kong, Singapore, Kuala Lumpur, Colombo, Bangkok, Kathmandu, Dhaka, Kuwait, Bahrain, Muscat, Doha, Abu Dhabi, Dubai, Jeddah, Sharjah and Riyadh.